If you are a visitor to the "prairie" state of Illinois, plan a unique ghost-hunting adventure and stay at one of Ilinois' haunted hotels. And if you are a resident of Illinois, get to know your state's spookier side and embark on an exploration of the unexplainable and visit one of Illinois's very own haunted hotels. One of its most haunted hotel is the historic Inn at 835, in Springfield, that is home to a benevolent ghost - its original founder Ms. Miller who has a penchant for candy. 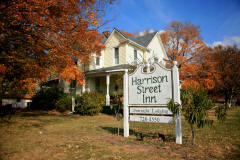 Tucked away in the sleepy town of Sullivan, Illinois is the charming Harrison Street Inn which cannot always guarantee its guests a good night’s sleep thanks to its permanent ghostly residents! 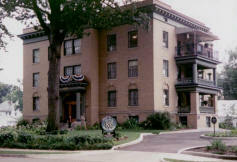 Before The Harrison Street Inn was turned into an inn, the building served as a boarding house for the majority of its 114 years. As a boarding house, it housed many actors (Alan Alda!) due to its proximity to the famous Little Theater on the Square. About 14 years ago, it was turned into a quaint inn, opening its doors to guests and to the delight of its many ghosts lonely for some companionship! Located in central Illinois, the historic Inn at 835 is said to be haunted by its founder, Bell Miller - so enchanted with her inn that she never wanted to leave...even in death. It was designed during the Arts & Crafts movement by architect George Helmle and completed in 1909. However to this day, there are guests and staff employees who still seem to spot Ms. Miller lingering around her "home." Many a guest and staff have heard a very friendly voice saying "Well, hello there." when no one was around. Guests often report that regardless of the button they push for the elevator, they wind up on a different floor. The elevator has been inspected and serviced many times with reports that it is in perfect condition, however, it continues to have a mind of its own...or of its past owner. A ghostly figure has been seen drifting through doorways. A mysterious book tucked well in the bookcase was repeatedly found in the middle of the room for no apparent reason. Strangely, when wallpaper began to peel off the wall, it was found to be fixed by itself. Ms. Miler must have a sweet tooth because every now and then you can hear the sound of the crystal lid being removed from a candy dish and then replaced, with no one around. The good news is that is seems that Ms. Miller is a benevolent and even friendly spirit. Just an added perk during your stay at this beautiful Inn. She is sure to welcome you.